The four crewmates awaited their commander’s response. When a sandstorm compels NASA to abort the Ares 3 expedition on Mars six days into their month long stay, the team is forced to leave behind a fully functioning habitat, two martian land rovers, millions of dollars of pre-positioned equipment, fifty days of freeze dried food for a crew of six (including fresh potatoes for their Thanksgiving dinner) and one dead astronaut. Last anyone saw of Mark Watney, flight engineer and team botanist, both he and his EVA suit were compromised, impaled by a communications antenna, tumbling off into the storm with his biometric sensors flat-lined. Forced by their grave situation to abandon the search for his body, the team leader makes the call and the Martian Ascent Vehicle (MAV) launches, leaving Watney to his fate. Fate, living up to its reputation for being fickle, has other plans for Mark Watney. Against the odds, he survives the suit puncture and impalement and manages to retreat to the expedition’s habitat, which weathered the storm intact. He’s alive and relatively uninjured. He has oxygen, water, and food for the next 300 days. Too bad Ares 4 won’t arrive for another four years, and then around 3200 kilometers from Watney’s refuge. It’s up to him to make his own fate and live to be there when Ares 4 lands. Watney’s got three things going for him: his ingenuity, his sense of humour in the face of death, and those six potatoes. Thus begins an extraordinary tale of resourcefulness and survival in the tradition of Robinson Crusoe, albeit in a place where everything can kill you. I first read of Andy Weir’s The Martian early last year while browsing an on-line review. At the time he was an independent author, and I downloaded a sample with every intention of buying a copy if it proved any good. Months later, I came across another article mentioning that Weir’s book had been picked up by a mainstream publisher and would be published in February of 2014. In the meantime, the e-book had become “unavailable” for purchase, a situation which left me somewhat miffed. However, the publisher was looking for reviewers on Netgalley, so I managed to snag a copy and dug in. Written from several points of view, the majority being epistolary journal entries by our stranded engineer/botanist, The Martian introduces us to Mark Watney, a thoroughly likeable and extremely resilient character for whom the reader cannot help but root. He’s no shrinking violet, bemoaning his fate and waiting for the inevitable, but rather your typical “can do” NASA type, working the problem methodically until he achieves one of two results: life; or death. Throughout the journal, Watney faces many life threatening situations (and some are doozies) and deals with them from an engineering perspective, true to form as…well…an engineer. With this emphasis on problem solving, The Martian is definitely a novel for lovers of hard science fiction, but Weir also develops a character for whom we feel a great deal of empathy, ensuring that the techno-babble doesn’t detract from the story. The addition of quite a bit of, “you have to laugh or you’ll end up crying,” levity on the part of Watney helps guarantee the novel not become too dreary. One worry I had while reading The Martian was that a novel with a single point of view can limit the author’s ability to build a picture of what’s going on in the greater world (or solar system, in this case). I wanted to know what the crew were thinking when they presumed Watney dead—and how they dealt with the guilt of leaving a crewmember not just behind, but behind on another planet. What was going on back at mission control? How was his family dealing with the loss of their son? These are all questions that would be impossible to answer had Weir stuck with the epistolary format, so it was satisfying to see him branch out from Watney’s tale and explore those very things. Transitioning back and forth from Watney’s journal to scenes of his crewmates and people back home gave greater depth to the story than showcasing his tale alone. I find generally these days while reading or viewing a movie that it’s hard to get invested in the welfare of the character because you just know that the writer (unless it’s G.R.R. Martin) is not going to do anything too drastic, like kill off the main character. Knowing that the author won’t take that risk tends to detract from the reader feeling any real investment in a story, but Weir deftly manages to avoid this pitfall. Every situation Mark Watney faces is written in a way that feels “life or death” in an Apollo 13 sort of way, and until the last few pages of the novel I was unsure as to how things would pan out. The ingenuity with which Watney, his former crewmates, and the people back on Earth tackle his predicament lends an air of optimism to a novel that could very well have lost itself in the malaise of a man bereft of hope. Lucky for us, this is not that type of novel. The Martian is one of those books that you’ll want to read in one or two sittings, maybe even burning a little midnight oil as you follow a lone Martian’s quest to become an Earthling once again. 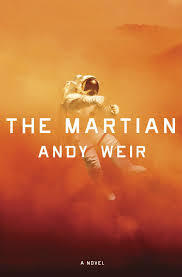 The Martian will be released by Crown Publishing on February 11, 2014.